Every now and then I stumble across an episode of “Hoarders: Buried Alive,” and I’m glued—and terrified. Each episode features someone with “hoarding disorder” living in a garbage dump stored inside a house. It’s simultaneously revolting and fascinating, especially because you and I don’t live that way. But could we? Hoarders don’t want to be hoarders any more than you or I want to gain 25 pounds. I mentioned several blogs ago that my Dad was a hoarder. So was my Mom. I know this because it took two and a half years of weekends and vacation time to clean out their house. Now, it was nowhere near the proportions you see on Hoarders; we were able to walk through rooms, mostly, and there were no floor to ceiling mounds of empty cans, used paper plates and take out containers. But there were lots of piles. Found at the bottom of the pile. When I asked Dad about it, he said, “Oh yeah. Your Mother bought that book for me.” I conquered it by burying it,” he joked. I suppose my Mom’s death 15 years earlier, combined with living alone and not having the ability to manage a 5 bedroom house were significant factors. Dad was a collector. He enjoyed the thrill of the bargain at least, if not more, than owning the item. I’m not a collector, but I have saved and stored lots of things I no longer need. “I might need/read/wear/use that” is the slippery slope at the bottom of which is me on an episode of Hoarders, engaged in a tug of war over the rotting carcass of a dead chicken. Books that I’ve read that I may want to read again sit on shelves, untouched. Clothes that I never wear are hung in my closet or tossed in drawers, taking up the space I need to store the things I actually use. The basement shelf used to store paint cans is so packed that it might collapse under its own weight, falling on top of the lot of lamps I will never use. My Mom saved a dress she’d made for me to wear as a flower girl years’ ago. Now I’m saving it. For what? Where is the line between “storing” and “hoarding”? Dad was the way he was. He grew up during the Depression, when having and saving things meant security and frugality. His model train collection gave him a lifetime of joy, which is priceless, regardless of how much it’s now worth. For me, selling his trains while getting rid of my own stuff is a way of making room for my life and new adventures to come. The things we hold onto can trigger memories, but are useless when tucked away on a shelf or stored in the basement. We only have so much room in our homes and in our lives; we don’t need our hearts to be cluttered. I suppose the key is to let go of the things that no longer serve or delight us to create the space for renewal. What Color is Your Ballast? Every year my father participated in his model railroad club’s “Open House,” an all-day event where anyone can stop in to see the club’s working layout. Occasionally, we went as a family. I hated it. There’s just only so much “don’t touch” train-watching a kid can take. Beware the sentence, “I’ll never, ever….” A few weeks ago I attended (voluntarily) a three-day regional conference of the National Model Railroader’s Association. A conference includes tours of local member layouts (you get a map, drive to somebody’s home and spend an hour in their basement) and operating sessions, where you do the same as above but participate in running someone’s home layout as if it were a real railroad. During “Ops Sessions” a dispatcher hands you instructions to “form” a train, car by car, and take it from “A” to “B” by a certain time. There are also scratch-built (hand-made) best-in-show modeling contests along with raffles and auctions—so you can take home more of the same stuff I’m trying to get rid of. Part of a local modelers home layout. The overhead wire system, called catenary, is scratch-built. I’m a dabbler; not a diver. I have many interests, to the point where I often find myself struggling to decide which ones to pursue. That’s why I know I won’t become a model railroader. although I have ample supplies should I change my mind. But I get it. 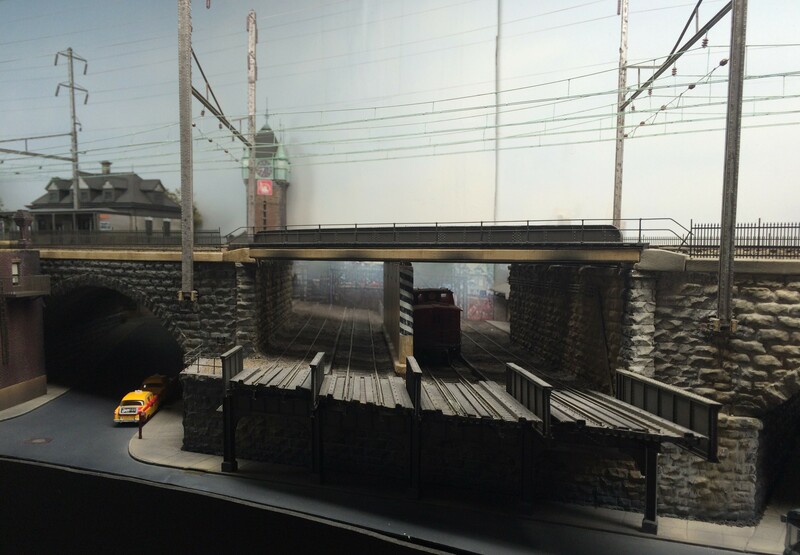 If you’ve got a passion for model railroading, it will be a source of endless fascination. The hobby is interesting, engaging and multi-faceted; it activates the creative mind, requires the continuous acquisition of new knowledge and skills and provides a social circle of comrades wearing railroad engineer hats adorned with buttons and patches. To those who love them: Be thankful they’re not into anything worse. My Mom and Dad were as different as bees and cats; one focused on doing and the other on being. Through my immersion in Model Railroading, a hobby that takes up many fruitless hours and requires tremendous patience, I have realized that my parents’ disparate traits are parts of me to be reconciled. My mother embodied perpetual motion, doing household chores, running up and down stairs, yelling at one or more of us to pick up this or clean up that. Raising five children was no easy task; after all she carried a diaper bag for 12 straight years! Her whirling would end after dinner when she collapsed on the couch, falling asleep almost instantly. She was a hyper-devout Catholic who demanded strict obedience to religious doctrine. Aside from our required attendance at Sunday Mass and attending Catholic school, all three of my brothers were Altar boys. The ubiquitous painting of Jesus whose eyes followed you no matter where you stood hung prominently in the living room while a large print of The Last Supper watched over the dining room table. We even had a Holy Water font at the front door and…prayer books on a small table in the first floor bathroom. I know there are many who have prayed to the porcelain god but I doubt that a single one of them thought, “If only I had a prayer book.” Perhaps my mother sought to narrow down the categories in the bathroom library. Yet I believe she was driven either by unyielding religious guilt or by shame, perhaps from an unspeakable childhood trauma. 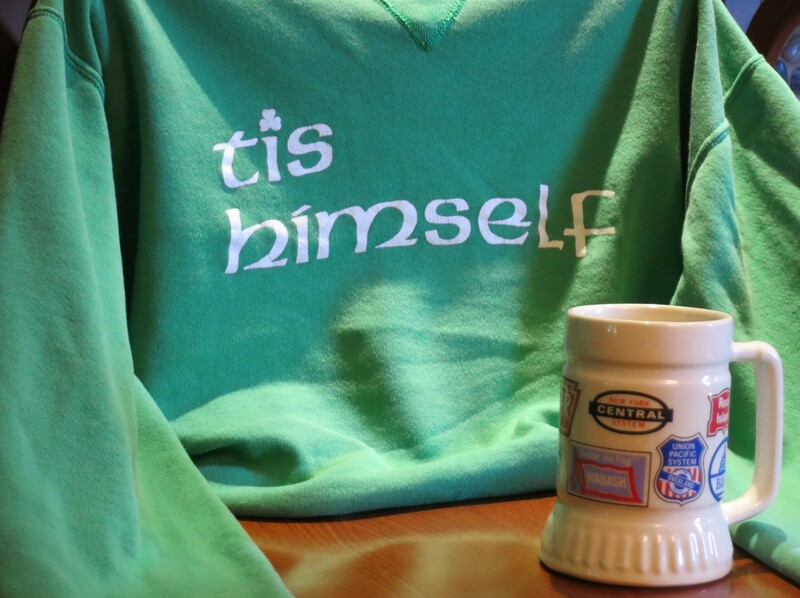 My Dad was an object at rest whose favorite sweater provided this simple introduction: “Tis’ Himself.” When he arrived home from his teaching job, he sat down at the kitchen table to read the paper while sipping a cup of coffee. In the summer, he would spend the early hours in his garden and then stop for a sandwich which he ate in the den (sometimes with a can of Rheingold) while watching the ballgame, shirtless. Sometimes he’d pick up a train he’d been working on and hours would pass as he absorbed himself in its challenges. He’d forget about the garden or whatever project he was working on at the time, and night would fall. Immersed in his hobby, he tuned out the world. Understandably, this was extremely frustrating to my Mother. But this is not to say he was careless. While it’s tempting to blame, we cannot see or judge our parents with any objectivity; we hardly understand ourselves. Only they know what happened and why, and they’re gone. And when they leave, we change. I got on well with my Dad; we shared many interests, including a love of words, history, learning, and jerry-rigging. We laughed at the same things. Yet these days I find myself struggling more with my Mom’s legacy. I too am an object in motion; my mind is busy and so is my day. Somehow in childhood I translated her busy-ness into “I am only as valuable as what I do and accomplish.” I long to feel the simple bliss of just being; of valuing myself for who I am. “Tis’ Herself”.